Cheers. I look happy in this picture, too, don’t I? This never happens. I mean, it pretty much never happens. 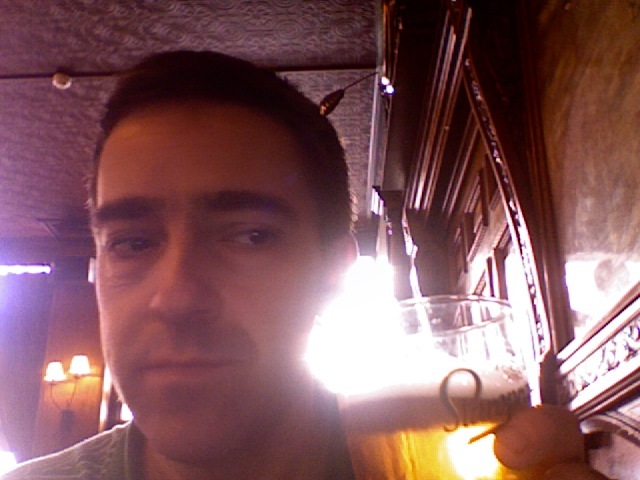 I am in a pub. On my own. At lunchtime. Here is my excuse: I left the coffee shop at St Pancras and headed over to Tottenham Court Road in Central London to where the studio is. The studio where we are recording the extra scene for Mr Blue Sky. When I got there, it turned out that, it being lunchtime, the producers and editor had gone for lunch. So, unwilling to give any more money to a coffee shop and having used up my Costa loyalty card privileges, I went to the nearest pub, and, using a special logic based on a combination of factors (it’s a nice day; I never do this; there were lots of spare tables; I felt a bit spare and lost; I need somewhere to wait for Michael Legge; it’s what Steve Lamacq would do and I am Steve Lamacq this week), I gave money instead to a pub for a pint of Staropramen, which I am hip enough to know is called “Star” when you ask for it, if you are an experienced drinker. Because I don’t go to pubs much, I like going to them. When I was at college, I used the canteen, where food was cheap and subsidised, and so were we, as we still got grants for being a student. Maybe UCL doesn’t have a canteen. I bet canteens are nicer now than they were then, too. Ours was like a school canteen. We loved it, but it was. I bet university canteens are all modern and healthy now, and I bet they have sandwich shops too. I do not deny students the right to go to the pub. But they shouldn’t eat in them. Well, here I am in the edit. 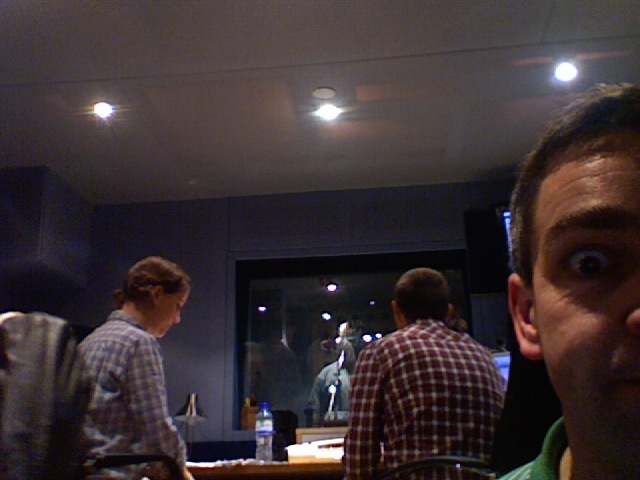 This is where my Radio 4 sitcom, Mr Blue Sky, is currently being turned into an actual thing that they can play out on the radio by my producers Anna and John and editor Rich. I don’t think my presence there on a daily basis would help. Better to just turn up, as I did today, and listen to a completed edit. Also, we had Mark Benton and Michael Legge in to record my brand new scene, one which we didn’t realise we needed in Ep1 until it was lashed together. It’s an establishing scene which, when you hear it on May 16 on Radio 4 at 11.30am, you won’t notice, hopefully. The 6 Music show was dominated by Roundtable, which, neatly enough, was revived for what used to be the Teatime slot when that slot was mine, and is now Steve’s. But for this week, it is mine again. Not much has changed. Some records, reviewed by a trio of guests, either musical or comedic, or, in the case of Matt Berry, both, as his new LP is why he’s on the market. As ever, it’s a potentially sweat-inducing presenting job, as you have to keep on top of the tracks being played, jolly along the panellists, read out extracts from what used to be called the “chatroom” and time your way up to the news, and to the handover to Marc in Manchester at 7pm. Also, it’s your job not only to impart information about the records under the hammer, but to elicit meaningful comments from the guests. Only a quick “one drink” in the pub afterwards, as we all had gigs and homes to go to, or trains to catch, but it was nice to unwind for a blessed hour. A full day, and an exhausting one. Another full and exhausting one tomorrow.